That is not to say that Laswell has abandoned the solemn tones of his previous work. The album features one of his most heartbreaking, and beautiful, songs to date, "Goodbye." It is not the absence of sorrow that makes Take a Bow so different, it is the juxtaposition and range of emotions that make it an exciting journey. One minute it's "Here's a firm goodbye to yesterday and the time I wasted... trying to find my way to you love"; the next it's "It was really nice to meet you... goodbye. It's high time I quit wondering why, 'cuz I have lost all that I can from my side." One of the most standout tracks is certainly "Come Clean," which starts with an almost madrigal-like, odd-metered feeling and develops into a fully enraged plea for the truth. In a recent interview, Laswell described the song as "the first time in a song where I’m pissed off. It felt good." It sounds pretty good, too. Other standout tracks include the first single, "Take Everything" (video embedded below), a fun tongue-in-cheek song about realizing someone's lies, and "Around The Bend," which captures that one moment before realizing a relationship is truly over. A new album is often a nerve-wracking time for fans of an artist. While the hope is to hear more of what we've come to love, using the same tricks and becoming a one-note is never good. 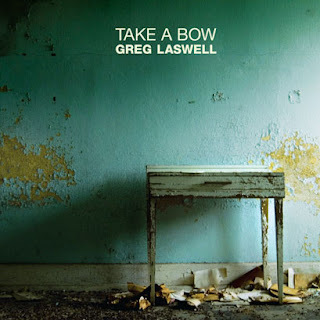 What Greg Laswell did with Take a Bow was to explore more of what we know and love of his music and expand it to places unexpected. That calls for a well-deserved bow.